NEW YORK -- The protester who scaled the base of the Statue of Liberty on the Fourth of July drew support and cheers outside a Manhattan court Thursday after she pleaded not guilty in the incident a prosecutor called a "dangerous stunt." 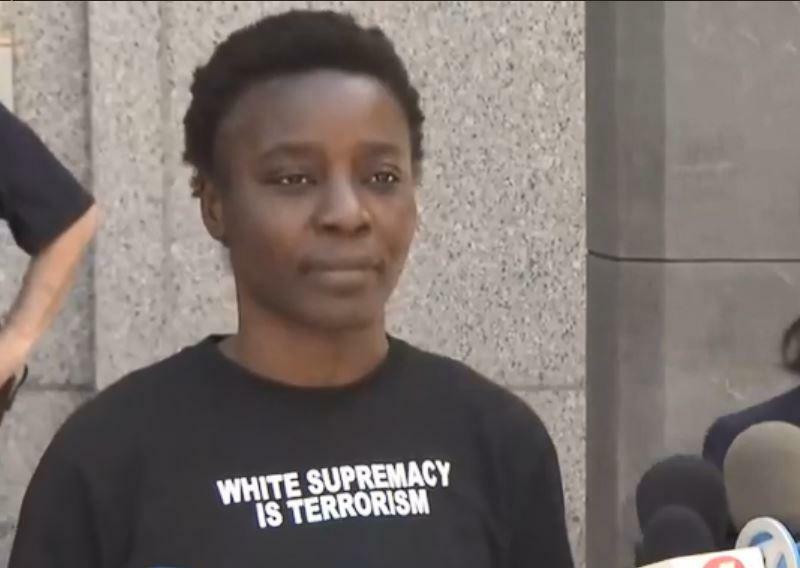 Therese Patricia Okoumou was charged with federal misdemeanors of trespassing, interference with government agency functions, and disorderly conduct. Charges allege Okoumou endangered her own life and the lives of the NYPD officers who responded when she refused to come down during a three-hour standoff. Court papers also charged Okoumou with resisting arrest by refusing to leave her perch by the bottom of the statue's robes, about 100 feet above the ground. Police had to scale the lower part of the statue to pull her down. Det. Brian Glacken of the NYPD Emergency Services Unit said at press conference that Okoumou talked to them about the "children in Texas," referring to the Trump administration's policy that separated families who entered the country illegally. Officers put a harness and rope around her to get her down. About 16 officers participated in the rescue, police said. Okoumou is a member of the protest group Rise and Resist, and joined group members who earlier in the day Wednesday hung a banner from the statue emblazoned with the message "Abolish I.C.E.," referring to the federal Immigration and Customs Enforcement agency. ICE is a division of the Department of Homeland Security whose officers arrest and deport unauthorized immigrants inside the U.S., among other duties. The group, which CBS New York reports was among the crowd of supporters Thursday, has said they weren't aware of her plans to climb the statue. In announcing the charges, U.S. Attorney Geoffrey S. Berman called the incident a "dangerous stunt." "While we must and do respect the rights of the people to peaceable protest, that right does not extend to breaking the law in ways that put others at risk," Berman said in a statement. Okoumou, a 44-year-old naturalized citizen who immigrated from the Republic of Congo in 1994, was met with applause as she spoke outside court, saying that while she wouldn't repeat her actions, she believes her message got across. She called for an end to the Trump administration's zero-tolerance policy on immigration and family separation at the border. Borrowing a famous quote from former first lady Michelle Obama, she said, "'When they go low, we go high.' I went as high as I could." Okoumou said she did a "pull up" to climb onto the statue's pedestal, calling the decision spur of the moment. She thanked the U.S. Park Police, who she said treated her with respect and courtesy. Okoumou also drew supporters on Twitter, where the hashtag #TheresePatriciaOkoumou was trending Thursday afternoon. U.S. Park Police Major Pamela Smith said the incident "caused disruption to thousands of visitors on one of the busiest days of the year at the Statue of Liberty." The National Park Service decided to evacuate more than 4,000 visitors from Liberty Island on Wednesday "out of an abundance of caution," said spokesman Jerry Willis. Average attendance for the Fourth of July is 20,000 to 25,000 people, he added. A National Park service spokesman told CBS New York's Reena Roy Thursday that Okoumou used a ledge above a doorway on the public observation deck to hoist herself onto base of the monument. If convicted, Okoumou could face up to six months behind bars on each count.